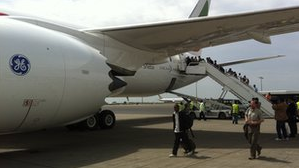 The Ethiopian Airlines Dreamliner flight carried passengers from Addis Ababa to Nairobi, the company said. The move follows the U.S. Federal Aviation Administration posting a directive outlining the modifications necessary for the Dreamliner to fly again. Japan this week authorized its passenger airlines to resume Dreamliner flights, but it wasn't clear when they would reinstate the aircraft. The Dreamliner's use of lightweight composite materials to greatly improve fuel economy has made it a big seller in Asia and the Middle East, where long-haul flights account for much of an airline's business. Instead they are operational when the plane is on the ground and its engines are not turned on, and are used to power the aircraft's brakes and lights.